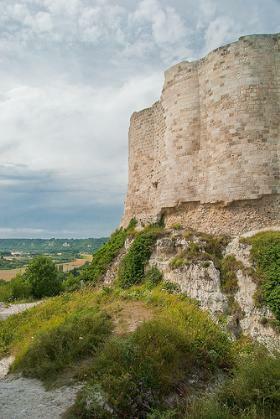 Château Gaillard is a castle at Les Andelys, Normandy, France. 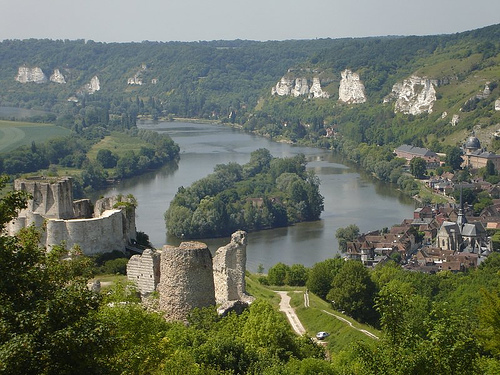 Richard I of England built the stronghold, of great originality, between 1197 and 1198 on the cliffs overlooking the River Seine, in order to protect Rouen and Normandy from Philip Augustus of France, to whom he had already lost several places, including Gisors. According to legend, the castle was planned by Richard I himself; he certainly took an active interest in it, but the castle fell to the siege of 1203–1204, leaving Philip free to enter Normandy. The plan was in harmony with the well-chosen site, a long spur connected with the plateau by a narrow tongue of land. The exposed position produced an almond-shaped (or ‘tear-drop’) solution, the point facing towards the direction of attack from the plateau. 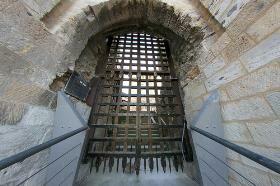 The shape was also reflected in the plan of the donjon. In addition to the finesse of its design, the castle was very carefully built: the wall surfaces were dressed in completely regular, alternating courses of white and grey stones, giving the building the character almost of a precious object. After the castle was abandoned, most of the accessible wall facings were stripped for reuse in nearby houses. The profoundly original design still puzzles historians of both art and siegecraft; for beneath the artful devices it was conventional enough. If Richard did design Château Gaillard, he would have been one of the finest theoreticians of fortification in the late 12th century. 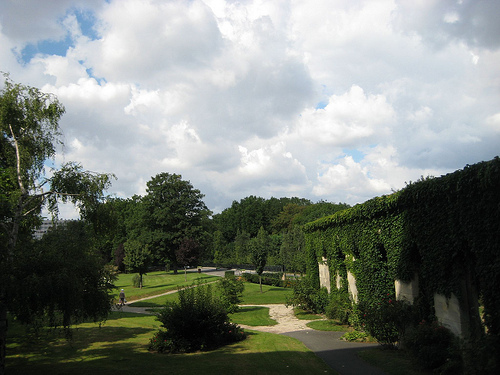 But in the event, the sophistication and refinement of the engineer–designer in the matter of fortification proved illusory in the face of the realities of war: French success was probably due to two actions, forcing the local inhabitants into the castle area, thus encumbering the besieged, and the famous entry to the castle through the latrines. The castle’s present condition is ruinous and slightly melancholy. Of the outwork, there are only the shapeless remains of the salient tower and the splendid vestiges of curtain walls, once equipped with wooden hoardings. 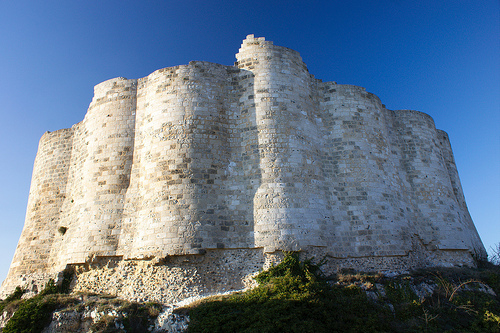 The middle bailey wall is better preserved, retaining in particular the rectangular tower armed with arrow loops, which dominates the Seine. The inner bailey wall is nearly intact, with its portcullised entrance and murder hole, and remains of the apartments, their windows overlooking the river, and the donjon, perhaps the most prominent memento of Richard I, the ‘Lion-hearted’, survive. Château- Gaillard is open from April to 6 November between 10,00 - 13,00 and 14,00-18,00. The Castle is closed each Tuesday and on 1st of May. A ticket price is 3,20 € for individual visit and 5,30 € for guided tours. Group visits must be booked in advanced.